Whether you are a spring and summer outdoor entertainer or love spending the afternoon with a good book and a glass of iced tea, a patio installation will expand your livable space and transform the way you enjoy your landscaping. A new patio is the perfect place to host parties, enjoy a late dinner after the sun sets, and have special family moments throughout the year. Carroll Landscaping offers high-quality patio design, installation, and maintenance to our valued clients. Here is what a patio installation looks like when you work with the experts at Carroll Landscaping. 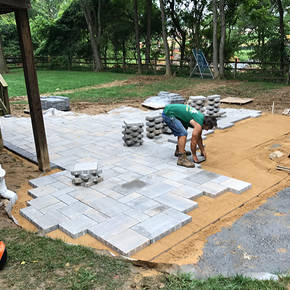 The patio installation process begins with a design meeting to determine the scope of the project, any constraints, the budget, and the right design for your style. Our landscape designers will walk through your property with you to assess how much site work will be needed and where the best place for the patio is. We will create a detailed design for your patio that fits in appropriately with your existing landscaping, hardscaping, and yard drainage. Next, we will work together to arrive at a final patio design that incorporates your feedback. Once the design and planning phase concludes, we move into the scheduling stage. Now that the final patio design for has been approved, our team will procure the necessary materials and schedule a date for the patio installation. Some customers are surprised to learn that there is typically a multi-week period of lead time required for an installation. Keep in mind that a landscape contractor who is always free is always free for a reason! 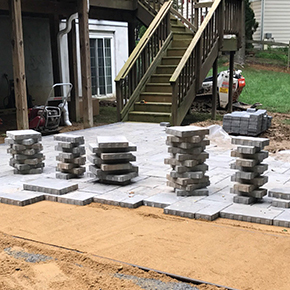 On the scheduled installation day, our patio installation crew will show up on time with all of the necessary materials. 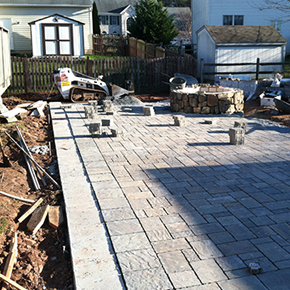 First, our workers will complete any necessary site work to prepare your yard for the patio installation. If there is debris or plant material that needs to be removed from the area, we will dispose of it properly or discuss replanting options with you. When the installation site is properly prepared, we will lay the base for your patio and begin the installation process. If your patio installation is a multi-day project, our workers will always find an appropriate stopping point and thoroughly clean the area before leaving. On the final day, our workers will ensure that the final patio matches the original specifications, that the area is cleaned up, and that your yard is put back together properly. We always leave our clients with a ready-to-use finished product so you can show off your patio later that evening if you would like to! If necessary, we will give you maintenance instructions to take proper care of your patio material.